Many folks never even heard of a Biff-Burger unless you were fortunate enough to grow up during the late 1950's, 1960's, and/or early 1970's before the majority of the original drive-in burger locations disappeared. I was fortunate enough to be raised in the Susquehanna Valley of Central Pennsylvania, where I can remember as a kid during the 1970's, before McDonalds, Burger King, and Wendy's came into town, there stood an interesting little multi-colored burger joint named Biff-Burger in Hummels Wharf, Pennsylvania, which was as popular and nostalgic as an old diner. The central Pennsylvania Biff-Burger was located in the town of Hummels Wharf along U.S. Routes 11 & 15 between the larger cities of Williamsport and Harrisburg, adjacent to the Susquehanna River, near Selinsgrove, Pennsylvania. Once the fast food burger giants and other fast food restaurant chains started building along the "Golden Strip", as referred to by the locals, Biff-Burger remained loyal to its customers and pushed on well into the 80's and 90's. Finally, after 35 years of business, the Hummels Wharf Biff-Burger sadly closed its doors forever in the Spring of 2001. A Short Note .... How it all started! The Hummels Wharf Biff-Burger is the primary reason for the existence of this website today! Originally, I had started the "Biff-Burger Website" as a single page in 2001 as a reminder of the 'good old days' I had at Biff-Burger growing up and during my undergraduate education at nearby Susquehanna University. This page was the core of the original website back in 2001. After the Forrey's, the previous and last owners, sold off the business and the structure was torn down, I created this website in memory of and as a tribute to the Hummels Wharf location of the former Biff-Burger Drive-In. At the time, I thought Biff-Burger was just a local establishment (like many other folks in the Central Pennsylvania area) and never knew that it was once part of a former hamburger franchise chain until I began doing research on Biff-Burger. Well, as you can see, the original single-page Biff-Burger website has grown by leaps and bounds, over the years, as the research continues and more and more information is revealed by my own desperation to know more. Today, the website acts as a vehicle for numerous dedicated viewers and Biff-Burger fans to share their information, comments, and stories about reminiscing the days of eating a hamburger with special sauce (the "Biff") or a curled hot dog (Biff Dog)! Anybody remember tater tots? 1965 The year Biff-Burger opened in Hummels Wharf. $0.19 The cost, in cents, of a burger at Biff-Burger in 1965. 1972 The year a dine-in seating area was built. 1974 Original Biff-Burger road sign struck by lightning and replaced with rectangular one with orange letters. $1.35 The cost, in dollars, of a loaded "Super Biff with Cheese", an order of french fries and a small soda in 1974. $3.39 The cost, in dollars, of a loaded "Super Biff with Cheese", an order of small fries and a soda in 2000. 2000 The year Hummels Wharf Biff-Burger goes up "For Sale". 2001 The year Hummels Wharf Biff-Burger closed its doors. In 1965, Leon Pontius, the owner of a boat dealership in Hummels Wharf was looking to open up another establishment. After looking at the portable pre-fabricated metal facilities that a Clearwater, Florida based company named "Biff-Burger" offered, he introduced the first fast food restaurant along Route US 11 & 15 directly across from his boat dealership. Mr. Pontius was also interested in opening up a second Biff-Burger in the nearby town of Sunbury, across the river from the Hummels Wharf location, however it never came about. The original building was the Port-A-Unit, a portable metal facility, which featured a 'walk-up' and 'pick-up' counter service while table seating was provided outdoors. The customers ordered from one window and picked up their food from another one after their number was called. The days of 'in-car' and outside table dining gave way to a seating area built at the front of the building shortly after the famous Hurricane Agnes flood in 1972. This new addition gave the Biff-Burger a slightly different look from its original walk-up counter appearance, however the original Port-A-Unit prefabricated building and "W"-shaped winged steel structure with its upswept roofs remained but just enlarged to include the enclosed seating addition. 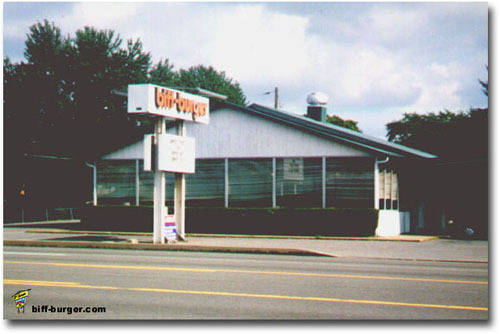 Despite the fact that the orange colored steel columns and beams, which supported the winged upswept canopies, were painted differently from that which were commonly painted a teal blue or white, the overall appearance of the pre-fabricated structure is similar to that of the only remaining Biff-Burger in St. Petersburg, Florida. Prior to 1975, the Biff-Burger sign looked similar to that which is erected at the Biff in St. Petersburg, Florida. In 1974, the original "Diamond Style" road sign was struck by lightning and was replaced with the long rectangular white sign with orange letters, shown at the top of this page. The yellow diamond portion of the original sign, below the name of Biff-Burger, was used for the current cost of a burger, which at the time was 15 cents, unlike the words of 'Drive Thru' on the current sign at the St. Petersburg's Biff Burger. Another interesting note is that in 1973, the only fast food competitor on the "Golden Strip" in Hummels Wharf and nearby Shamokin Dam was a Carrols -"Home of the Club Burger". McDonalds opened their doors one year later in 1974 and Carrols later became Burger King in 1976. The first Carrols fast-food restaurant was franchised by Slotnick in 1961 from the Tastee-Freez Company. Slotnick built nearly 50 Carrols restaurant locations across upstate New York (mostly in the Syracuse region) over the next few years. By 1968, Slotnick was able to purchase the Carrols Chain from Tastee-Freez, the Chicago-based company that originally created the hamburger chain in 1959. Shortly afterwards, Slotnick also incorporated his family's 148-movie theater chain into the new Carrols Development Corp. The company would later sell off the re-named Cinema National movie-theater chain, exiting the theater entainment business by 1983. That same year, Carrols changed its name to Carrols Corporation and later listed its stock on the New York Stock Exchange. During the early "burger wars" of the late 1960's and 1970's, the Carrols Development Corp. converted its Carrols restaurants over to Burger Kings. By 1978, all the 120 Carrols restaurant locations had either been converted to Burger King or closed. Today, the Carrols Coporation is known as the Carrols Restaurant Group, and is one of the largest restaurant managing company in the United States operating three different restaurant brands with nearly 550 company-owned and operated restaurants and 30 franchised restaurants in three countries. Of the three restaurant brands, Carrols is the largest Burger King franchisee. So now you know what happened to all those Carrol restaurant locations and its connection with Burger King. After McDonalds and Burger King opened in nearby Shamokin Dam, numerous other fast food places soon followed and opened their doors to the ever growing "Golden Strip" but none was as loved and remembered most by the locals than the ole Biff, of course "Ho Hum", just up the street was a classic too, but that's another story. According to a local publication (Caves of Snyder County, PA, MAR Bulletin No. 10, printed by the Mid-Appalachian Region of the NSS, 1976), it references 2 local caves and an organization identified as "BBET". Interestingly enough, BBET stood for the "Biff-Burger Exploration Team", presumably an outdoor recreation group of enthusiasts that worked at the Hummels Wharf Biff-Burger or somehow affiliated with the restaurant and enjoyed exploring the great outdoors; which in this case, has been documented to have been exploring local caves. During the Winter of 2000, Mrs. Forrey, the last owner of the restaurant, sadly put the beloved Biff-Burger up for sale, however the doors never opened again and the broilers never broiled another hamburger. So, during the Spring of 2001, the once orange colored steel girder restaurant with green roof was sadly dismantled. For weeks, all that was left that reminded local patrons, was the still standing white rectangular sign with "biff-burger" spelled in orange lower-cased letters. Even the Super Biff with cheese special was still on the marquee board below the sign, however no remnants of the oddly shaped building remained. Eventually, as the parcel of land was sold to Sunbury Motors and being prepared for its new owner and tenant, the once proud glistening "Biff-Burger" sign that welcomed so many customers throughout the years was taken down and carted off to someone's private collection of nostalgia items nearby. Today, a "KIA" car dealership, managed by Sunbury Motors, now occupies the parcel of valuable land along the 'Golden Strip', which the former Biff-Burger occupied for 35 years. If you look closly enough at the existing KIA roadsign, one will see that the only remaining reminent of the former Biff-Burger are the two original white I-beams firmly mounted in concrete that once supported the orange and white colored "Biff-Burger" sign and marquee. Part of my childhood is gone, but I still have the fond and wonderful memories of that delicious mouth watering roto-broiled taste of a Super Biff with cheese Special and a curled hot dog, which can never be taken away! Um, Um, Um ! Note: "For Sale" sign on pavement underneath sign.